Dr. Bradley is a Professor of Radiology and the Chairman of the Department of Radiology, University of California, San Diego Medical Center, San Diego, CA. With continued improvements in magnetic resonance imaging (MRI) technology (specifically stronger, faster gradients and higher magnetic fields), the quality of MR angiography (MRA) has improved exponentially. 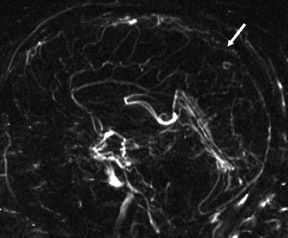 By catching a bolus of gadolinium from an intravenous injection as it passes through the arterial phase, it is possible to obtain high-resolution arterial images without venous contamination. 1 This requires the use of the stronger, faster gradients, which are also required for echoplanar imaging (EPI). Contrast-enhanced MRA (CE-MRA) is based on a T1-weighted 3-dimensional (3D) gradient-echo acquisition, most often in the coronal plane to get the largest possible coverage (which is the 25- to 35-cm field of view, rather than the usual 1- to 2-mm slice thickness of unenhanced MRA techniques). Gadolinium is administered at a dose of 0.1 to 0.2 mmol/kg through an antecubital vein, most often using a power injector. The rate of injection varies from 3 mL/sec for the carotid arteries to <1 mL/sec for the run-off vessels. 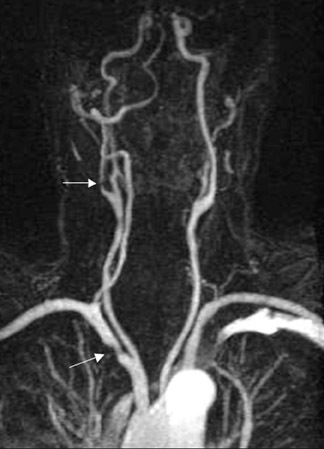 Image acquisition in the carotid arteries can be performed as multiple 10-second acquisitions, one of which is bound to be acquired during the arterial phase, prior to the contrast bolus reaching the jugular veins. 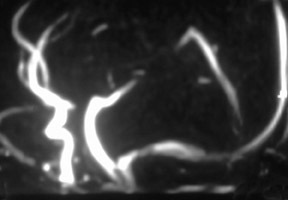 This "multiphase" technique does not require any kind of bolus-detection software to determine when the gadolinium first arrives in the artery. Alternatively, the acquisition can be set up to start immediately after the contrast first reaches the artery of interest. This either requires a preliminary timing run or automated bolus-detection software. 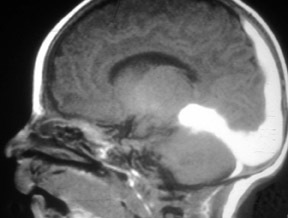 The timing run generally consists of a 2-mL injection of gadolinium followed by T1-weighted gradient-echo images acquired perpendicular to the vessel every half second, with notation made as to when the vessel initially acquires its maximum brightness. This is then used to determine the timing delay when the actual procedure is performed. Automated bolus-detection software (such as SmartPrep [GE Healthcare, Waukesha, WI], CareBolus [Siemens Medical Solutions USA, Inc., Malvern, PA], and BolusTrak [Philips Medical Systems, Bothell, WA]) consists of a cursor placed in the aorta upstream from the vessel of interest. When the signal intensity inside that cursor (prescribed from a scout view) turns bright, the sequence begins. While this technique has been found to be very robust below the aortic arch, it is less so above the arch; therefore, CE-MRA of the carotids generally requires the use of a multi-phase technique or performance of a preliminary bolus timing run to determine the circulation time. Recent enhancements for CE-MRA of the runoff vessels include phased-array coils, eg, Siemens' Total imaging matrix (Tim) technology (Siemens Medical Solutions), and a stepping table (eg, SmartStep [GE Healthcare] or MobiTrak [Philips Medical Systems]). With such a device, the bolus of contrast can be followed as it progresses through 3 stations of acquisition: abdomen-pelvis, thigh, and lower leg. 2 When a stepping table is available, unenhanced scans (masks) of the leg, thigh, and abdomen-pelvis are obtained prior to the injection of contrast. Then, without moving the patient, automated bolus-detection software starts the acquisition to include the abdominal aorta and renal arteries as well as the iliac arteries in the abdominal pelvic acquisition. The table then moves automatically to the thighs, where a second acquisition occurs, and then subsequently to the leg, where the final acquisition occurs. 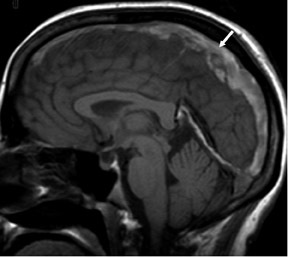 The initial mask image is then subtracted from the image with contrast, yielding the CE-MRA. Since this is a 3D acquisition, the data can be subjected to a maximum-intensity projection (MIP) algorithm and can be rotated to be viewed from any angle. It is also important to view the individual source images (ideally by scrolling on a workstation), as the MIP algorithm tends to make stenoses appear more severe than they appear on the source data. K-space is a mathematical construct that facilitates the visualization of different fast MR imaging techniques. 4 Diagrammatically, k-space consists of a matrix of 256 × 256 points (ie, the number of frequency and phase points), with each phase value corresponding to a horizontal row and each frequency sampling point corresponding to a vertical column. Typically, the most negative values of the phase-encode gradient are at the bottom of the matrix, those with the weakest phase encoding are in the center, and the k-space lines with the strongest value of the phase-encode gradient at the top. Since weaker phase encoding leads to less dephasing, most of the signal comes from the center of k-space. The idea behind elliptical-centric k-space acquisition is to start acquiring in the center of k-space just as the contrast hits the arteries of interest. The term "centric" k-space coverage refers to a single-slice technique-eg, 2-dimension-al (2D) time-of-flight (TOF)-while the term elliptical centric refers to a 3D TOF technique in which there are 2 nested phase directions, ie, the traditional phase direction and the slice. 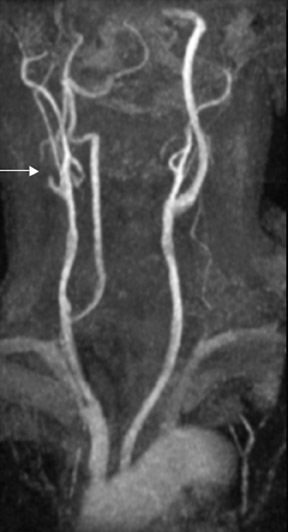 Contrast-enhanced MRA can be used in the carotid arteries to visualize atherosclerosis and its complications: ulceration, stenosis, and complete occlusion. 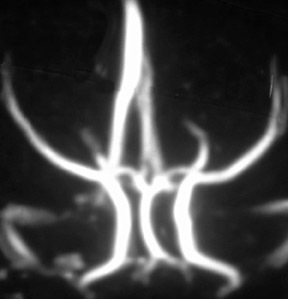 7 Contrast-enhanced MRA has the advantage over unenhanced MRA techniques (such as 2D TOF and 3D TOF) and multiple overlapping thin-slab acquisition (MOTSA) because of its use of gadolinium and its minimization of dephasing through tight stenoses (Figure 1). 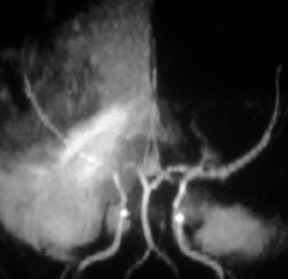 In most institutions with modern MRI systems (with EPI gradients), patients are evaluated with duplex Doppler ultrasound and CE-MRA of the carotids (Figure 2); if a ≥70% stenosis is detected, patients undergo endarterectomy without the need for catheter angiography. Contrast-enhanced MRA has been used to evaluate the thoracic and abdominal aorta 8 for the presence of coarctation, 9 aneurysms, or pseudo-aneurysms, atherosclerosis, ulceration, and intraluminal web. 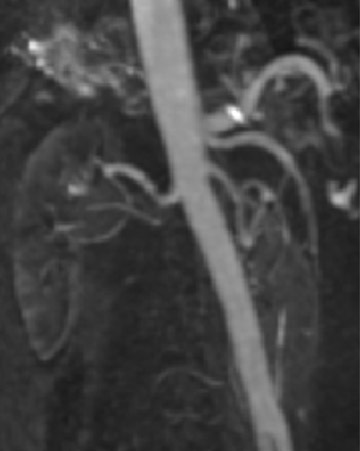 While aortic dissection can be evaluated with CE-MRA, it is better and more rapidly evaluated with balanced SSFP techniques, eg, TrueFISP (Siemens), FIESTA (GE), or balanced fast field echo (Philips) 10 oriented perpendicular to the aorta (compared with the parallel orientation of the coronal plane usually used for CE-MRA). 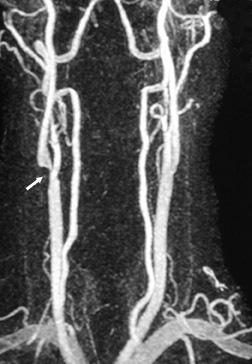 Contrast-enhanced MRA of the aorta can be used in preparation for vascular bypass surgery, placement of stent grafts, or evaluation of claudication. MR angiography of the renal arteries has been the Holy Grail of body MRA since its earliest applications almost 2 decades ago. Unfortunately, until CE-MRA became technically feasible, the normal aortic pulsations limited the efficacy of unenhanced MRA. Now, with extremely fast CE-MRA techniques (with time to repetition [TR] <3 msec and echo time [TE] <1 msec), MRA of the renal arteries is now both routine and robust. 11 We typically place a cursor in the aorta superior to the kidneys on a scout view and use automatic bolus-detection software to trigger the acquisition, which is performed in the coronal plane. At the completion, the images are MIPped and rotated around a vertical axis for review. If a stenosis is suspected on the MIP, we scroll through the source images on the workstation to determine if the stenosis is truly present. Such studies are now used routinely at our institution for the evaluation of patients with suspected renovascular hypertension 12 or fibromuscular dysplasia (Figure 3). 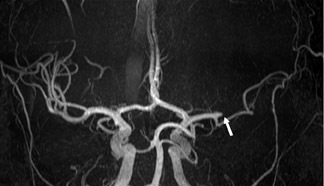 There is an excellent correlation between CE-MRA of the runoff vessels and angiography. 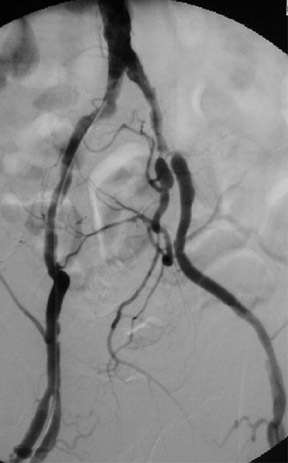 15 While one might argue that angiography affords the interventional radiologist the opportunity to treat and diagnose a patient at the same time, stenoses in certain locations-eg, the inguinal canal-may require surgical rather than endovascular treatment. Similarly, when a single good runoff vessel is identified to receive a bypass graft, angioplasty may be required to relieve an upstream stenosis, eg, in the iliac or femoral systems. Unfortunately, gadolinium has recently also been shown to cause a potentially fatal disease in such patients. 18 Approximately 5% of patients with renal failure who receive gadolinium chelates will develop a scleroderma-like disease known as nephrogenic systemic fi brosis (NSF). 19 Furthermore, 5% of patients with NSF will have a fulminant course and could potentially die from this disease (for which there is no cure). Most patients with NSF have had Stage 4 (glomerular [GFR] <30 mL/min/ 1.73 m 2 ) or Stage 5 (GFR <15) renal failure; however, at least 2 have had Stage 3 (GFR <60). 20 Nephrogenic systemic fibrosis occurs in patients with chronic renal failure who are on dialysis and in patients with acute renal insufficiency, eg, due to hepatorenal syndrome. Having a liver or kidney transplant increases the chance of a patient developing NSF. Having a vascular access procedure (eg, an arteriovenous graft for hemodialysis) also increases the chance of developing NSF. 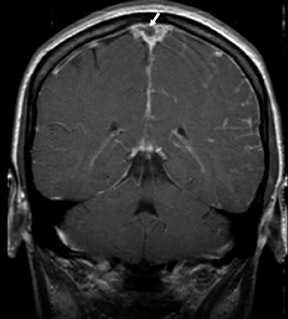 One exception to the use of unenhanced TOF techniques in the brain is in the setting of acute stroke. 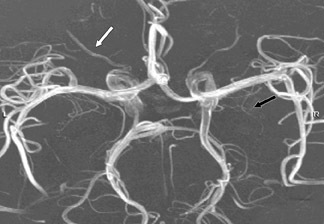 In this case, time is of the essence, so we use a neurovascular coil and CE-MRA, opening up the longitudinal field of view to 35 cm to include the circle of Willis as well as the great vessels and aortic arch (Figure 7). 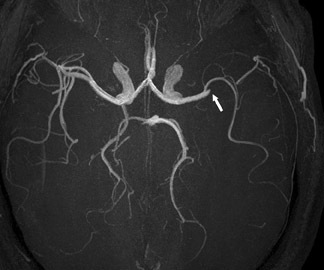 In such cases, very high spatial resolution is not required; however, it is absolutely necessary to exclude carotid stenoses (which will increase the mean transit time [MTT] of the perfusion study) and to show an occlusion of the middle cerebral artery by an embolus. Phase-contrast MRA (PC-MRA) requires 4 separate acquisitions (baseline and 1 phase-encoding acquisition along each of 3 axes) and, thus, takes longer than TOF MRA for a given matrix and TR. Phase-contrast MRA is useful whenever subacute hemorrhage is present (Figure 8). The MIP algorithm picks up anything bright, assuming it is inflowing blood. Since methemoglobin is also bright, it will be picked up by the MIP and will degrade the image. If there is subacute thrombus in a dural sinus, it is even more important to use PC-MRA, as a TOF study would suggest that the dural sinus is patent (Figure 9). MR angiography continues to improve as gradients get faster and stronger and as field strength increases. 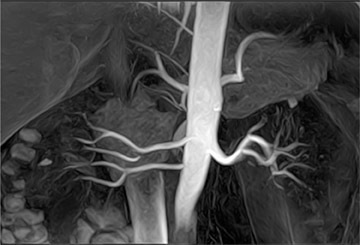 In many situations in which catheter angiography was required in the past, MRA (with or without contrast) can now suffice. In the near future, DSA will be required only for interventional procedures. 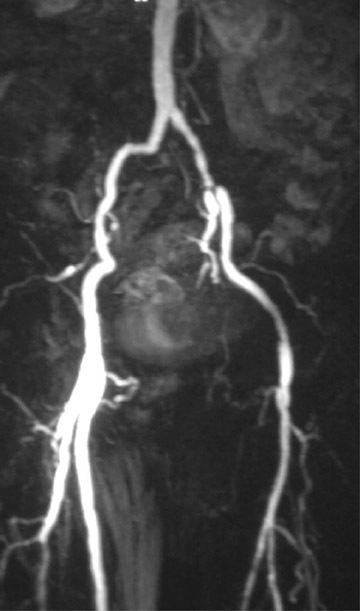 Contrast-Enhanced and Unenhanced MR Angiography. Appl Radiol.